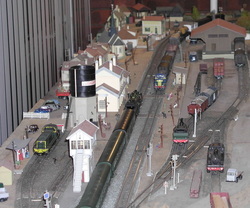 SNCF - FRENCH RAILWAYS - “HO” SCALE. A layout by PHILIP WORSFOLD. Lusigny-sur-le-Loir represents a small town served by an important secondary line in the Région Ouest (Western Region) of the French Railways, not far from Tours. It is at the meeting point of the Normandie, Loire and Sarthe areas. The layout shows what there might have been on an autumn day in the early 1960’s, when steam trains were still dominant, but diesel traction was beginning to take over. 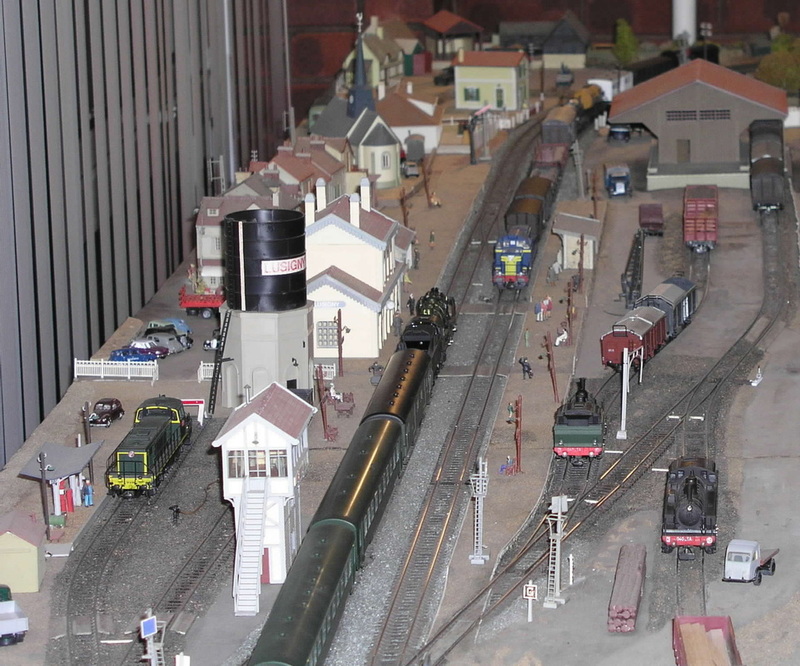 The layout has been around a long time, having first seen the light of day in 1988 in Norfolk. Since then it has been exhibited many times. A number of modifications have been made but it is basically unchanged. It runs as an ‘old fashioned’ 12v dc system but has stood the test of time in its reliability. It was built originally for exhibitions to show what could be done using proprietary plastic kits and ‘off the shelf’ models but over the years a few exceptions have crept in. As far as practicable, all the rolling stock used is correct for the period and for the chosen area of France, although there is a little licence taken over the period when it might have been there. 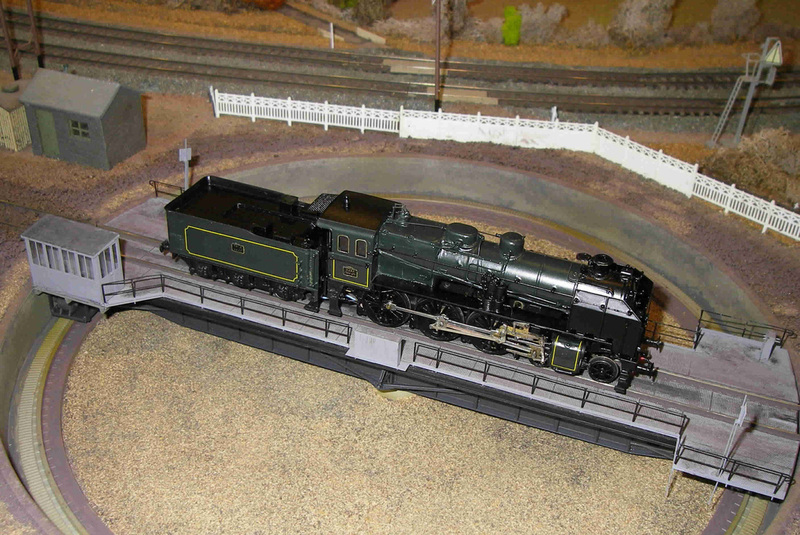 There is too much rolling stock available to list it all but some of the favourites are listed below. The layout is a double track circuit in format, laid on ten modular boards, supported on trestles and occupying, when set up, a space of 4.88m x 2.52m (16’0” x 8’3”) without its integral protective barriers. Control is from within the centre of the layout. 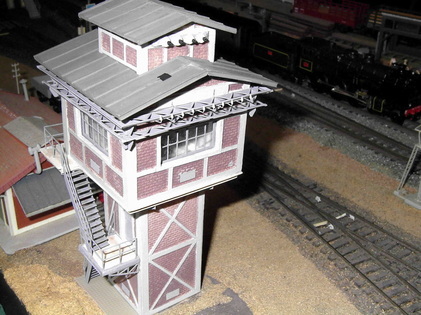 The front, scenic section represents the station with freight facilities and a private siding serving a saw mill at one side of the line; and a small loco depot with turntable and refuelling facilities for both steam and diesel traction on the other. These features can be controlled either from the main controllers or from an independent hand held controller. 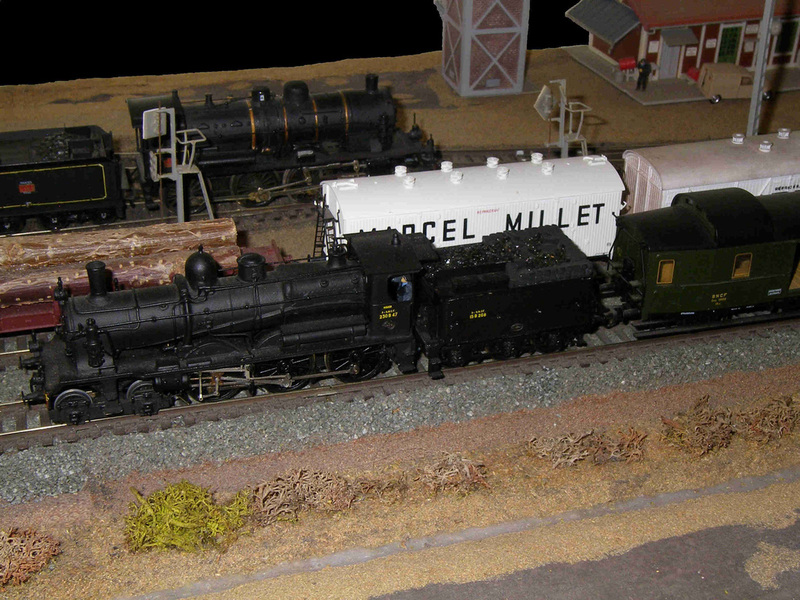 The rear of the layout, from the viewing side, is a storage yard with four through tracks and five dead end sidings (one used as a head shunt) on each side of them. Telephone: Tiverton (01884) 821 805. 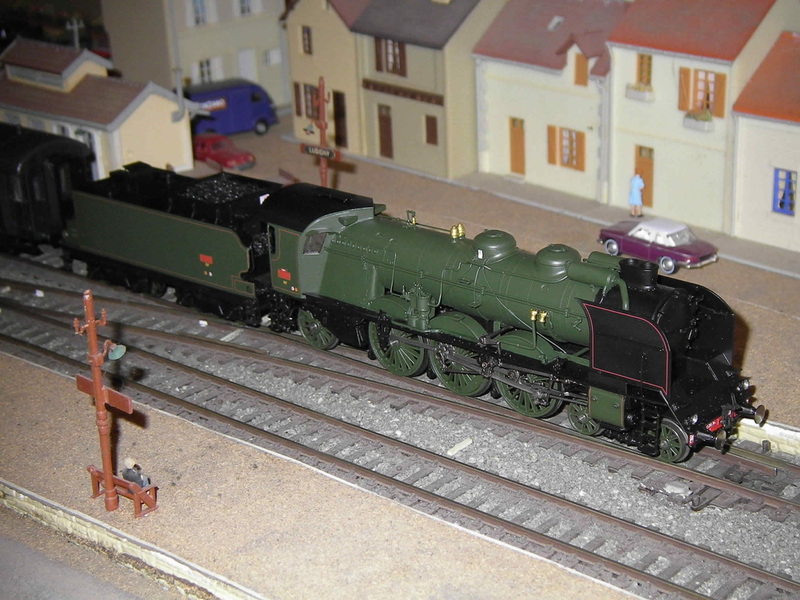 Kit built 3.230K class 4-6-0 mixed traffic, ex Paris-Orléans Railway, transferred to État Railway. Modelbex and REE. 4 different models of 4.231G and 2.231K ex PLM Railway Pacifics, rebuilt by SNCF and used on several regions. Roco US Army S160 2-8-0 (140US) ; and REE US Army 0-6-0 (030TU) - like the Southern region USA tank engines. Model ‘bashed’ from off the shelf models. 5-040 A 0-8-0 'Old timer' - a rebuild using the stretched body of a Rivarossi 030A on the heavily modified chassis from a Jouef 040TA. Diesel Traction – all ‘Off the shelf’. Mistral X4200 single railcar "Panoramique"
…And a lot of passenger and freight rolling stock appropriate to the period.